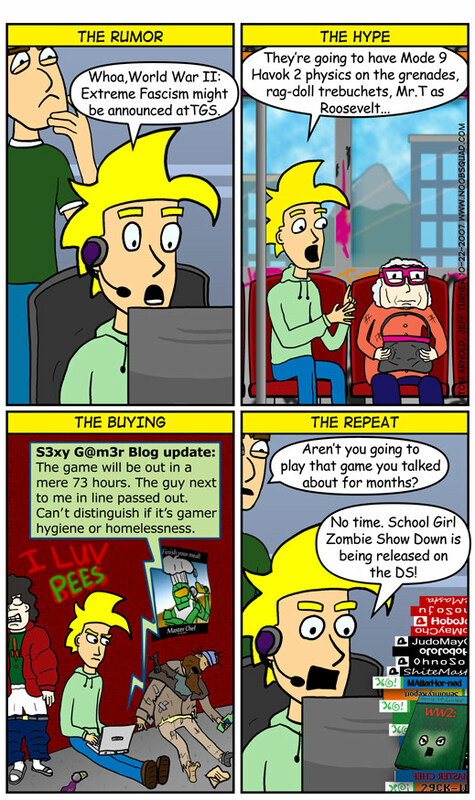 N00b Squad - "The Vicious Cycle"
I forgot to mention in the last comic that my Xbx 360 bricked the biscuit one day after the one year warranty expired. I talked my way out of paying half of the $165 standard repair bill only to have good ol' Peter Moore announce a three year warranty four days later and a refund to all gamers who had to pay for repairs already. This of course, happened four days after Microsoft took my money and I still do not have it. I expect a generic letter to be sent to all Xbox 360 owners two to three months from now such as their “Your Xbox will explode” power issue letter from the past. The 360 time-out gave me a chance to play some Wii and PC games caught in the Vicious Cycle pictured above. In the end, Metroid Prime 3 beat out Bioshock as my favorite to play. Both great games but I attribute that to the significant “investment” of time I've put into Metroid over, uh, my life. I remember playing Metroid 1 while my brother tried to sketch maps of the world for reference; Just like Christopher Columbus, but without the scurvy. My only gripes about Metroid Prime 3 at the moment is how the world is split up into multiple worlds, the 99.9% spot-on Wii controls sometimes don't detect turning, and pulling back the wiimote never works too well. For pulling back an object, pool in Wii Play is another example where the a hugely exaggerated pull back motion is required to detect motion instead of a more subtle, tool-box gesture. Still love Metroid and Wii Pool though. I hear some game is coming out tomorrow, something about a circle with a big hole in the middle and its the third one. Apparently, there is a tax that states all 360 owners must buy that game so I have one pre-ordered. Other video game taxes include: Mario, Metal Gear Solid and Star Craft. Doesn't matter if the game receives 0/10 because it won't and you will still have to buy it. Personally, I'm looking more forward to Project Gotham Racing 4 with Geometry Wars: Waves on the 360 but then again, maybe I was dropped on my head as a baby. Then again, maybe all of you were instead. Tried playing Quake Wars on Friday with the Saint and Electron on Friday only to have Punkbuster say “NOOOOOOOOOOO!” to me multiple times for no known reason. Eventually I gave up and played the highly addictive Peggle Extreme from pre-ordering The Orange Box. Pop Cap always manages to deliver a highly polished product: crack in the form of a game. I don't normally play online games but Team Fortress 2 could change that. Similar to how the Wii makes games accessible to all, TF2 makes online team first person shooters accessible to me (clearly Valve's focus). The style and layout reminds me of a Disneyland ride. There are even videos before the level to show n00bs, like myself (see site URL) to help out. To top it off, Portal and Episode 2 still come with the game. If you want something that will last a really long time, Orange Box is definitely the way to go. Well, maybe tomorrow I'll talk to some bus people about Metal Gear Solid 4. Work is well underway at the N00b Science Center on the next comic after conquering the convenant and having robots not hate us. After strenuous testing, the N00b Science Center has produced N00b Swag, our new store for t-shirts and other merchandise that we may fathom while pondering the limits of pause and play. I figure we've done fifty comics at this point so we've earned it. Our first shirt is “Press Start 2 Peter Moore” capturing the timeless moment of the always debonair millionaire marketing master Peter Moore pressing pause not once, not thrice but twice during E3. A brillant strategy, thus forth securing the rights to having his name called out whenever pause is pressed in-game for all time.